The Becker Digital Voice Communication System DVCS6100 is a fully ETSO and TSO certified state-of-the-art airborne digital audio selector and intercom system. Designed for both fixed and rotary wing aircraft, the DVCS6100 delivers crystal-clear voice communication quality, a proven Man-Machine-Interface (MMI), unsurpassed reliability, and remarkable scalability and flexibility through its fully configurable software platform. The DVCS6100 from Becker represents a monumental step forward for current users of legacy analog systems and a logical choice for any aviation professional looking for digital audio solutions. The main system components of the DVCS6100 are the Remote Electronic Unit REU6100 and the Audio Control Units ACU6100, ACU6101. 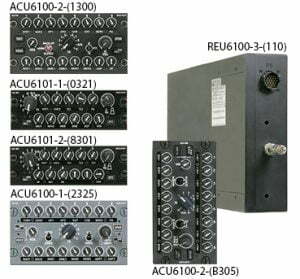 A DVCS6100 application is comprised of one Remote Electronic Units (REU) and up to six Audio Control Units (ACU) or glass cockpit applications. Each of the six ACUs transmits the status of the selected switches and rotary controls via a dual redundant and rugged serial CANbus to the REU6100. Impedance matching and audio digital signal processing takes place within the REU6100. The REU6100 central unit also supports connectivity with FMS or glass cockpit systems by means of the RS422 interface. Certified in 2005, as digital audio system achieving Technical Standards Order (TSO), as well as European Technical Standards Order (ETSO) certification, the DVCS6100 has set the standard for the industry.